Grady-White’s Freedom Series of dual consoles are “Customer-designed for big water and the freedom to experience the ultimate in boating versatility.” The Freedom 225 is not a new model and in fact has been a Grady-White dual console staple for several years and in 2015, is one of nine Freedom dual console models ranging from nineteen to thirty-seven feet. 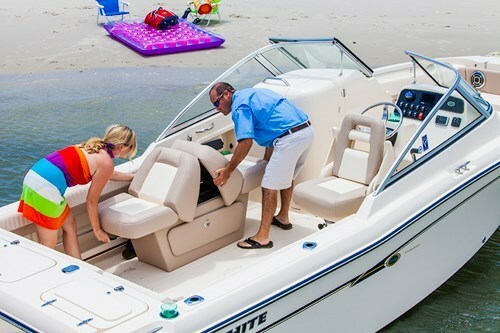 Grady-White also offers twenty additional models in four other series of Center Consoles, Coastal Explorers, Express Cabins, and Walkaround Cabin boats for 2015. Dual consoles are steadily becoming more and more popular due to their versatility in that they are not only great fishing boats with the obvious flexibility of allowing the fisherman instant access to the entire boat from bow to stern not only to separate onboard fishing locations but also often necessary for the landing of the big one. 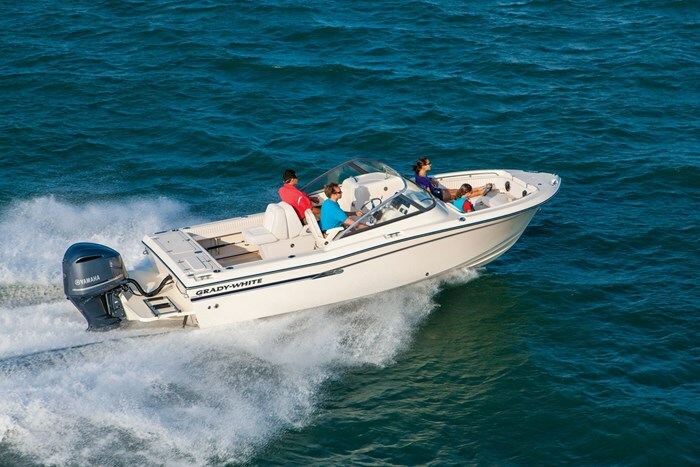 With its full windshield and available weather tops, plus its safe interior depth, the dual console with its variety of seating options is a great cruising and exploring boat suitable for the entire family. And to top it all off, the dual console, with its often flexible power options, becomes a great watersports enthusiast’s boat. 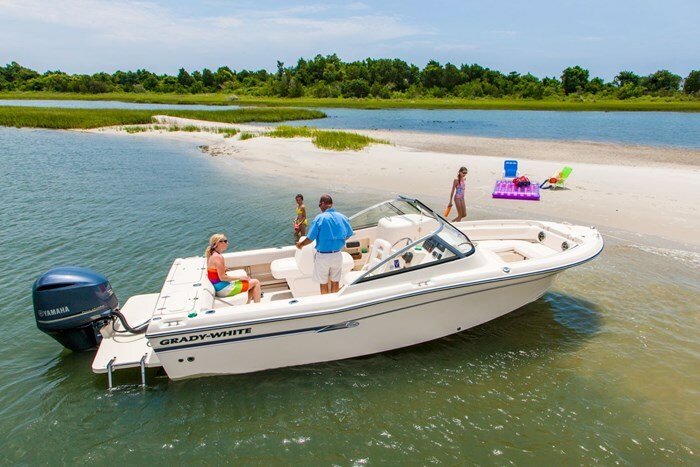 Kind of a boat for all reasons and the Grady-White Freedom 225 is a prime example of all of the above attributes plus it has a full fibreglass inner liner with self-draining cockpit, basic flotation, lots of freeboard, plus a pronounced bow flare to promote a dry ride in rough waters. Ahead of the tall walk-thru windshield with standard starboard windshield wiper, the U-shaped bow seating area with surrounding low profile stainless steel safety rail has side bolstering and seat cushions all around with storage under the port and centre bow cushions. Under the starboard seat cushion is an insulated 52-quart ice/fish box with overboard drain. On the bow foredeck is a dedicated anchor locker. Driver and passenger companion receive standard Deluxe I chairs with Deluxe II horizontally and vertically adjustable chairs optionally available for both locations. At the helm, you can also choose the Deluxe III helm chair which adds a flip-up bolster. On the passenger side, you can also choose the optional port lounge seat with sliding tilt backrest and storage drawer or a sleeper seat with fore or aft-facing backrest and storage drawer. A fold-away two-seater transom bench seat is also standard. The driver’s helm console features a stainless steel steering wheel, footrest, 12-volt accessory outlet, compass, plus a flush mount electronics area. This console also houses a lockable storage compartment with service light plus lockable tackle drawers. The passenger helm console houses a lockable head compartment complete with porta-potti, dome light, mirror, teak and holly sole, plus storage nets. One of the neatest standard features on the Freedom 225 is the full-width swim platform with boarding ladder. The full platform allows freedom of access across the entire transom of the boat close to water level. The motor is mounted at the back of this platform. Within the transom with top-loading access is a 175-quart insulated ice/fish box plus a 22-gallon insulated storage compartment which may be optionally converted to a lit livewell. Other notable standard equipment includes cockpit toe rails, freshwater shower, blue LED cockpit lights, twelve stainless steel drinkholders, trim tabs with indicator and retractor, six horizontal rod storage racks plus four rod holders, and a 10-gallon freshwater tank. Notable options include various canvas coverings to full enclosure with or without the optional hardtop with spreader lights or the soft top arch. You may also choose cockpit bolsters, an AM/FM stereo with VHF receiver, amplifier, remote control, four speakers and MP3 and Bluetooth® connectivity. Also available is a ski pylon, bow table, and raw water washdown. 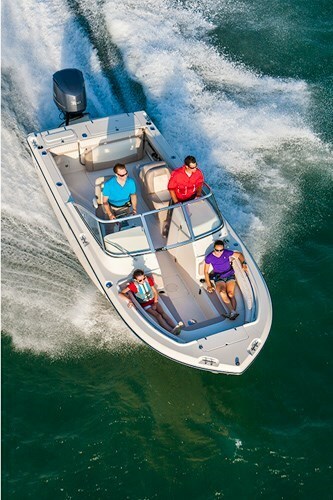 The Freedom 225 is rated for maximum 300 horsepower. In reviewing Grady-White performance reports, it might seem that the 4.2L Yamaha 250 Four-Stroke may be the optimum choice of power since its optimum cruising speed of just shy of 30 mph at 3500 RPM while consuming 8.3 (US) gallons per hour is almost identical to the results of the 300 horsepower. And top speed with the 250 is only 3 mph shy of the 300 at just over 50 mph.